Pyrethrum, Tanacetum cinerariifolium, is sometimes known as Pyrethrum Daisy. Flower heads are dried and powdered for use as an insecticide. The basis of some commercial insecticides. Pyrethrum paralyses insects but has little to no effect on mammals. A companion plant. 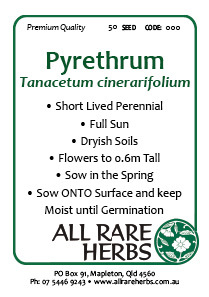 Pyrethrum is native to Europe and prefers a moist free draining soil with free lime, in an open sunny position. Drought and frost tolerant. A perennial plant, growing to 0.6m x 0.6m. Be the first to review “Pyrethrum, seed” Click here to cancel reply.